Canada officially legalized cannabis on Oct. 17. This was widely seen as the biggest catalyst for pot stocks in recent memory. Yet, every pot stock dropped following this catalyst, signalling that this monumental catalyst had become a “sell the news” event to the market. Canopy Growth (NYSE:CGC), Tilray (NASDAQ:TLRY), Cronos (NASDAQ:CRON) and Aurora (OTCMKTS:ACBFF) have all dropped from their pre-legalization highs. This isn’t the end of pot stocks. Instead, it is just a temporary pause in a long-term secular growth narrative. Once this pause is over, it will be time to buy the best pot stocks. When it comes to the best pot stocks, there is one clear winner: CGC stock. Due to its early market leadership, distinguished track record, biggest production capacity, widest portfolio of brands and billion dollar partnership with Constellation Brands (NYSE:STZ), CGC stock is by far and away the best investment in the cannabis sector. But, that doesn’t make the stock a buy here and now. Instead, investors should expect all pot stocks to be choppy over the next few weeks as the legal roll-out of weed in Canada faces some inevitable road-bumps. Eventually, those road-bumps will stabilize. So will pot stocks. At that point, fundamentals say CGC stock is a buy. Until then, though, there isn’t any rush to buy the dip in a name that has already run up quite a bit. In other words, patience is the key when it comes to tracking the CGC stock price. The long-term trend is positive, but investors should exercise patience in order to mitigate near-term risks. 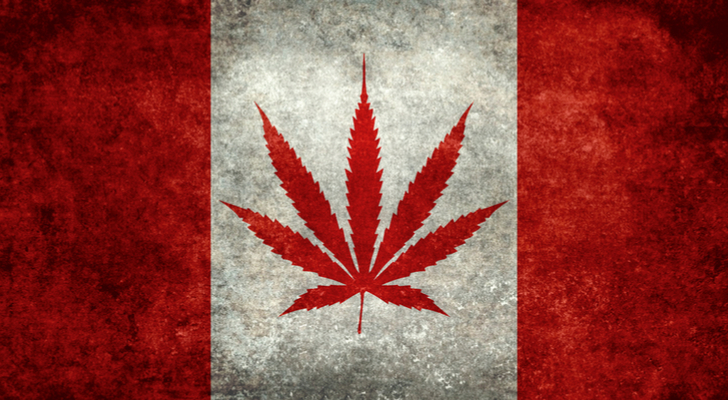 Weed is legal in Canada, and that is a huge thing. The recreational cannabis market measured in at $6 billion in 2017. Inevitably, that number will grow as legalization prompts new people to try cannabis (read this story about first-timer Genevieve Despres). Thus, most estimates peg Canada’s recreational cannabis growing to be anywhere between $6 billion and $9 billion over the next several years. Meanwhile, the medical cannabis market is projected to be a $3 billion annual revenue market in Canada. Thus, between the medical and recreational markets, we are talking about roughly a $10 billion annual revenue opportunity in Canada. Will all those sales happen legally? At first, no. But over time, yes. Just think about Prohibition in the United States. After Prohibition was repealed, a majority of sales of alcoholic beverages moved to legal channels. Today, essentially all sales happen in legal channels. Thus, Canopy’s addressable legal cannabis market in Canada should measure around $10 billion within five years. Because CGC is the market leader with the most growing capacity, a wide portfolio of brands, and a big partnership, Constellation Brands is projecting 30% to 40% market share for Canopy. Let’s be more conservative and call it 20% market share. That would imply $2 billion in revenues. At scale, operating margins at Canopy are projected to hit 35%. That implies $700 million in operating profits. Take out 20% for taxes. You’re looking at $560 million in net profits by 2023. Throw a growth-average 20 forward multiple on that. Canopy’s valuation from the Canadian market alone could be $11.2 billion in 2022. Discount that back by 10% per year, and you arrive at a 2018-19 valuation of somewhere around $8 billion. CGC stock currently has a market cap of $10 billion. The present value of the Canadian business is $8 billion. Thus, in order to justify today’s valuation, you have to assume that the present value of business everywhere besides Canada is $2 billion or more. That is easy pickings. The global cannabis market ex Canada is projected to be essentially 20-times as large as Canada. Thus, assuming the present value of that business is equal to one-fourth the present value of the Canadian business seems exceptionally reasonable. Thus, not only is today’s valuation on CGC stock justified, but it has plenty of room to expand assuming cannabis legalization moves forward globally. Although CGC stock projects to be a long-term winner, I wouldn’t rush in and buy the stock here and now. The legalization of cannabis throughout Canada is a huge undertaking that will inevitably have multiple road-bumps. Indeed, we are already seeing the biggest of these road-bumps, which is supply shortages. Across Canada, weed retailers are running out of stock as supply can’t keep up with demand. This supply shortage is expected to persist over the next several months. During that time span, I wouldn’t be surprised to see more hiccups emerge given the complexity and uniqueness of the current situation. Those hiccups will drag on pot stocks, CGC stock included. Regardless of long-term potential, these stocks are priced for near-term perfection. But, near-term perfection is exactly what won’t happen. Presumably, then, pot stocks likely won’t head higher in the foreseeable future. Eventually, these hiccups will be smoothed out. When that happens, it will be time to buy more CGC stock. Until then, patience is key to mitigate near-term risks. Near-term pain, long-term gain. If you already own CGC stock, stick with it. If you are looking to get in, wait until hiccups in the Canada legalization process get smoothed out. Article printed from InvestorPlace Media, https://investorplace.com/2018/10/patience-is-the-key-with-canopy-growth-stock/.